Flights to Thailand are serviced by approximately 70 airlines. Chiang Mai International Airport (CNX) is a 10-minute, 4-mile drive from the city centre. A single terminal serves both international and domestic flights. The following international carriers fly directly to CNX: Air Asia, Air China, Air Mandalay, Bangkok Airways, Cathay Pacific, China Airlines, China Eastern Airlines, Korean Airlines, Lao Airlines, Singapore Airlines, Silk Air, Tigerair, Thai AirAsia, Thai Airways International, Nok Air, Scandinavian Airlines, Swiss International Airlines, and V Air. You can also fly into Bangkok and then take a domestic flight to CNX. Air time is 1¼ hours. The following airlines travel to Bangkok: Air China, Air France, American Airlines, British Airways, Cathay Pacific, KLM Royal Dutch Airlines, Lufthansa Airlines, Qantas, South African Airways, United Airlines, and Vietnam Airlines. There are two airports in Bangkok, Suvarnabhumi and Don Muang. The CNX air terminal features ATM’s, currency exchange kiosks, Wi-Fi cafés, restaurants, a duty-free zone, and vendors selling silk and local produce. Note – To obtain the best air fare, reservations must be made well in advance of your trip. The distance from Bangkok to Chiang Mai is approximately 400 miles. Ground transport involves an overnight journey by train or bus. As an alternative to flying, you can take a train from Bangkok to Chiang Mai. It will take you 14-16 hours, depending on the number of stops on the train route. It is recommended that you travel at night by sleeper car so you can enjoy the landscapes entering Chiang Mai. These include bridges, fields, forest, mountains, and a spectacular Chiang Mai sunrise! Recommended evening departure times are 6:10pm and 7:35pm. If you opt to travel during the daytime hours, recommended departure time is 8:30am. There are three classes of train carriage, each differing in seat comfort and width. First and second class offer sleeper cars with comfortable bunks and clean linens. First class always offers air conditioning. Second class sometimes offers AC. Carriages are clean. Vendors sell snacks, beverages, and meals at inflated prices. It’s advisable to bring your own. There’s also a dining car with fairly good fare at a reasonable cost. Later in the evening, the dining car can morph into a disco with loud music and flashing lights. For details on what is included in each carriage class, click here. 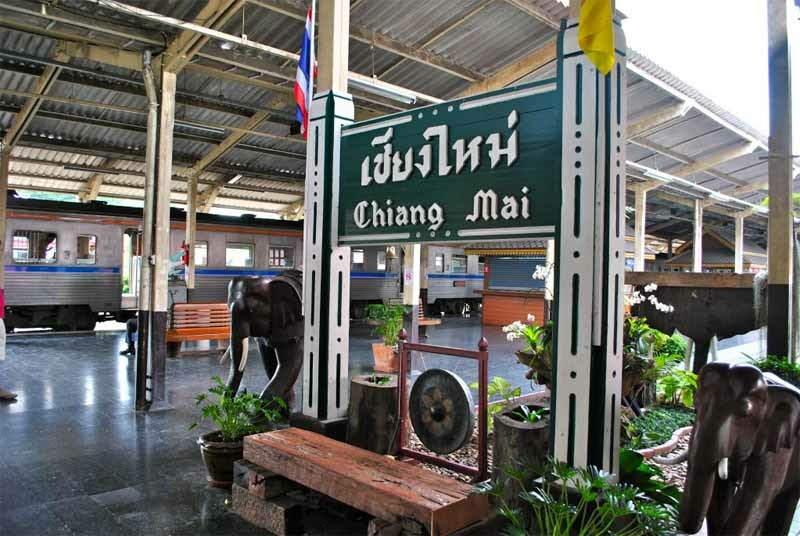 Chiang Mai Railway Station is located at 27 Charoen Mueang, approximately 3km east of the city centre. From the train station, you can take a songthaew to our resort. Details are provided below. Please note: Train air conditioning can be very strong. Be sure to bring a warm jacket. Traveling from Bangkok to Chiang Mai by bus is the least expensive means of transport. Daily buses depart from Bangkok’s Northern Bus Terminal, known as Mo Chit 2, in the Chatuchak Market area. To get to the bus terminal, take the skytrain from the Suvarnabhumi Airport Station to the end of the line at Mor Chit/Chatuchak Market. Then take a 10-minute taxi ride to the terminal. Buses vary by price, comfort, and speed. VIP buses are the most comfortable, being air-conditioned. Buses depart approximately every hour from 6am to 10pm. The trip from Bangkok to Chiang Mai takes about 12 hours. Service is provided by either the government or private companies. There are two bus stations in Chiang Mai, one for long distance travel and one for local trips. Chiang Mai Arcade Bus Station handles daily long distance travel. The station is located on Kaew Nawarat Road, near the superhighway intersection. It has two terminals, separated by a tuk-tuk stand and a road. Terminal 2 has a tourist police office, ATM’s, food vendors, and ticket sellers, including the booking office for government buses. Terminal 3 has a Wi-Fi café, ATM’s, food vendors, ticket sellers, and the booking window for the Green Bus (Window 20). You can obtain bus schedules by calling 053-242-664. The Chang Phuak Bus Station, known as Terminal 1, provides local bus service. It is located off Chang Phuak Road, on the north side of the moat, about 1 km north of Chang Phuak Gate. Call +66 53 211586 for schedule information. Note – Local bus stops are not easily identified. Buses run every 15 minutes, by which time about ten songthaews may have passed by. A better option may be to hail a songthaew. 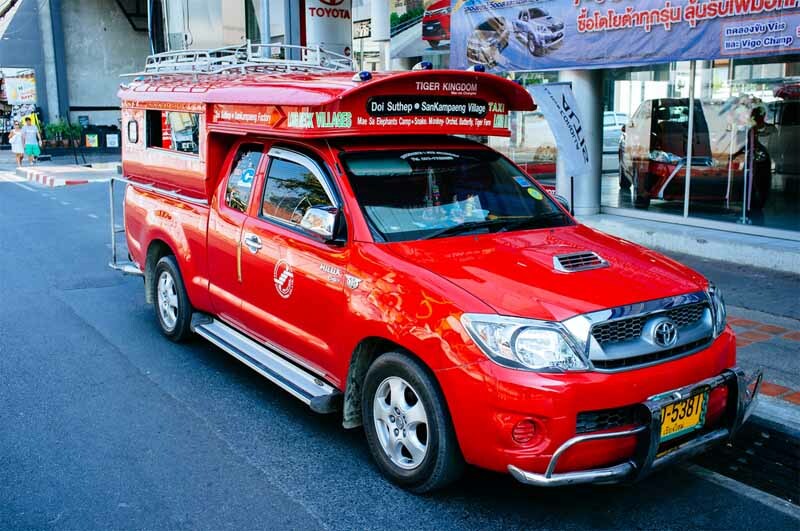 A songthaew is a van-like vehicle converted from a pick-up truck. It has two rows of seats in the back for passengers. It operates as a share-taxi, transporting people along various routes. At Arcade Bus Station, public songthaews wait near Terminal 3. Fares vary by town but are reasonable, especially when shared among passengers. Note – Prices for songthaews are negotiable! Red – does not follow a specific route. Red songthaews roam the main streets around markets, temples, bus terminals, and train stations. They are the most convenient to use if you have a specific destination. White – follows a fixed route from Warorot Market to the eastern suburb of Sankampaeng. Yellow – travels to Mae Rim in the north. 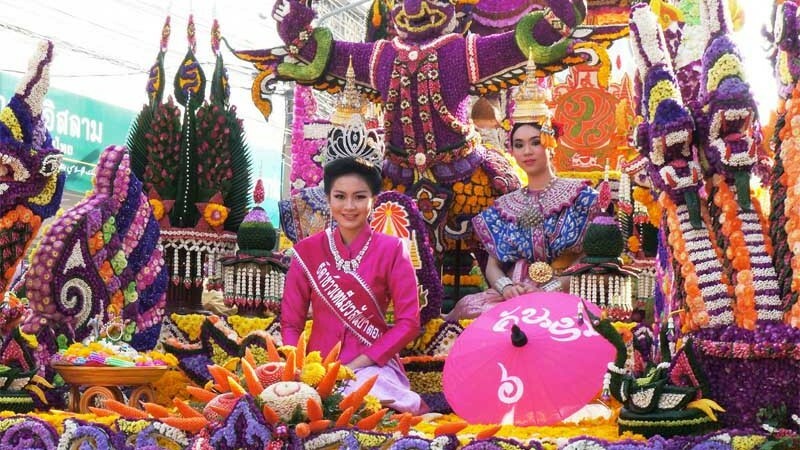 Blue – heads to Sarapee and Lamphun in the south. Green – goes to Mae Jo in the northeast. To call a songthaew, wait at the roadside until one approaches and hail it by stretching your hand out, palm down. Ask the driver if he goes to your destination. If it is on his route, he will nod and give you a price. Negotiate a lower fare if you wish. The agreed-upon rate should be per person. Confirm this with the driver before you leave. When approaching your destination, ring the buzzer on the roof to signal the driver to stop. Then pay your fare. If your destination isn’t on a driver’s route, he will shake his head “No,” and drive on. Just wait until the next songthaew comes along, which is typically every few minutes. If you get into a parked songthaew, the driver will assume you wish to charter it. He will not stop to pick up other passengers. Songthaews can be chartered for a half day or full day of sightseeing. Just negotiate an agreed-upon rate and pay at the end of your trip. Taxis tend to limit service to airport runs and private calls. They are a good option for transport directly to our Chiang Mai hotel. They feature air conditioning, honest drivers, and safe travel. Drivers work on a fixed price from the airport, which is more than you’ll pay for a songthaew or bus. If you plan to use a taxi, have small notes on hand. Many taxi drivers do not keep small change. Taxis operate from the exit at the north end of the CNX terminal. After Customs and Baggage Claim, walk into the reception area and turn left. Generally, you cannot hail taxis from the street. To book a taxi, call Chiang Mai Airport Taxi at +66 53 201307 or +66 53 922128. When you call, state your destination, and the Call Centre will give you a quote. Bangkok traffic is extremely heavy. Many of Bangkok’s roads change their one-way direction at certain times of the day. The number of road lanes may also be reduced. Driving at night is extremely hazardous. Local cars often have broken headlights, making it hard to see them.